If you need to link several networking cables together, or extending existing cable runs, In-line Cat5e Coupler can help you make the right connection. Cat5e crossover coupler is an cost effective way to easily convert two standard Patch cables into a crossover. Junction box is for splicing two Ethernet Cat.6 cables together without the use of connectors and couplers. The punch down connection provides secure continuity. Keystone Snap-in Cat5e couplers provide a full range of solutions for voice, home networking, home office, audio, video and more. Keystone Snap-in Cat6 couplers provide a full range of solutions for voice, home networking, home office, audio, video and more. It works with wallplates and blank patch panels. If you need to link several networking cables together, or extending existing cable runs, In-line Cat6 Coupler can help you make the right connection. Cat.5E Right Angle Coupler with Keystone Jack Latch allows you to connect networking cables together to be used in tight spaces like server racks and gang boxes. Cat.6 Right Angle Coupler with Keystone Jack Latch allows you to connect networking cables together to be used in tight spaces like server racks and gang boxes. 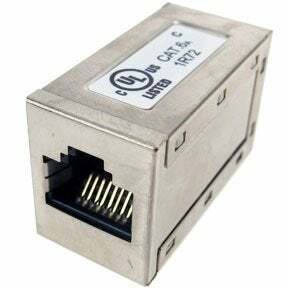 Cat.5E STP Right Angle Coupler with Keystone Jack Latch allows you to connect STP networking cables together to be used in tight spaces like server racks and gang boxes. We have a wide range of networking accessories including quality Cat 5E/6 couplers. You can order Cat 5E/6 couplers at SF Cable and get them delivered at your doorsteps. You can choose from Cat 5E RJ45 Inline couplers, Cat 5E RJ45 Inline crossover couplers, Cat 6 RJ45 Inline couplers, Cat 5E Junction box (punch down type), Cat 6 Junction box (punch down type), Cat 5E inline coupler w/keystone latch, Cat 6 inline coupler w/keystone latch, Cat 6 RJ45 full shielded inline couplers, straight thru inline couplers, crossover inline couplers, shielded industrial panel mount bulkhead couplers, shielded industrial panel mount bulkhead jacks, male to female cross over adapters, etc. These couplers are used to extend or repair existing patch cables. We, at SF Cable, offer you competitive prices without compromising on the quality of the products. All the products are manufactured by ISO 9001-2000 registered manufacturers and RoHS compliant. We also provide lifetime technical support on all our products.